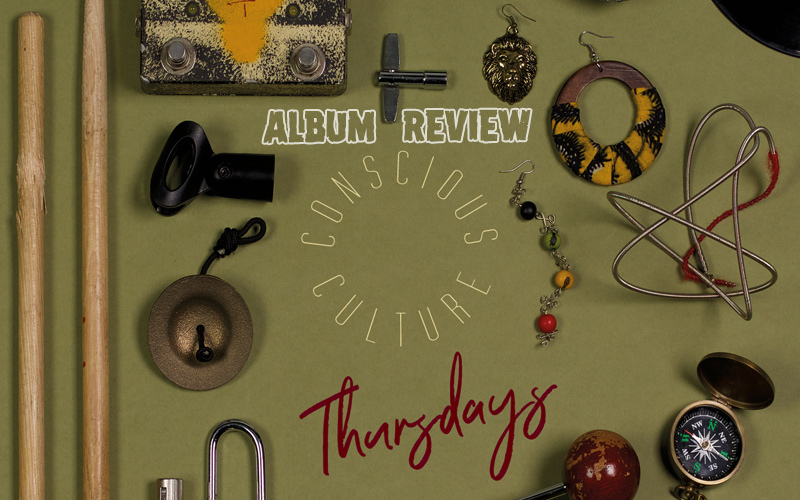 To call an album Thursdays means that this day must have a special meaning to Conscious Culture, the band behind the release, especially when it's their debut. Maybe their first ever performance fell on that day? Maybe it was the day of their weekly band practice? Or do they simply love the "ThrowBackThursday" Hashtags #TBT? Whatever the reason, their debut is worth listening to. Three female front singers (Nadia Eva, Sista Kira and Malijah) as well as six skilled musicians (Florian Bohde, Manfred Kirch, Diego Viteri, Marc Steinweg, Sebastian Pathé and Güntuğ Eren) make up the formation based in the German cities of Cologne and Aachen, and they represent a lively cultural mix coming up with positive messages. Displaying a unique, modern Roots sound that is dominated by warm bass, straight drums and a Hammond organ, the influences of Jamaican and English Reggae pioneers is clearly audible. Likewise, their identification with Rastafarian principles is reflected by lyrics circling around subjects such as firm belief (Protected By Jah) or the admiration of creation (Conscious). Time Flies, a passionate plea to love yourself, is as uplifting as the introductory New Beginning and the groovy Heads Up, and both tracks transport a lot of the atmosphere that, judging from the pictures and videos on their Facebook profile, fills the air during their live shows. A refreshing vocal splash is the feature of Mtapa Taa from Kenya in New Generation, a track including snippets of the often-cited speech of H.I.M. Haile Selassie so present in Bob Marley's War. Another great addition is the voice of Denham Smith, a Jamaican singer who is currently living in Cologne, in the sweet, flirtative Talk. With Roots And Wings, my personal favourite, the mellow mood of the release reaches its climax and sends the listener off with a smile into a golden late-summer afternoon (in my case). No surprise this young band won the U-Club Band Contest in 2016 – they deliver a fine package of good musicianship, pleasant vocals and conscious lyrics. And, rest assured, Thursdays can be heard on every day of the week!